A Tribute Garden that is being created to honor domestic violence victims, survivors and their families will be dedicated Saturday, Sept. 27, during the 5th annual Break the Cycle Bike-a-Thon and Walk in Isle View Park, 796 E Niagara St., Tonawanda. The bike-a-thon and walk will raise money for the Tribute Garden. Registration begins at 8:30 a.m. and the ride and walk begin at 10 a.m. The event is hosted by the Erie County Commission on the Status of Women and local domestic violence advocates and community volunteers. The idea for the Tribute Garden evolved in a process that started five years ago after Aasiya Hassan, a mother of two, was beheaded in Orchard Park by her husband, Muzzammil S. Hassan, who is now in jail. That’s when the Break the Cycle bike and walking event was started to raise awareness of domestic violence, said Beth A. Curtis, chair of the Erie County Commission on the Status of Women. The event also raised some money, and it was decided that the funds could be used to create some sort of a permanent monument to remember and honor victims and their families. Something made out of stone would be too cold, Curtis said, and could look too much like a grave marker. Organizers wanted something that would memorialize and honor the lives of victims, both living and deceased, and not focus on the pain they went through or their deaths. A garden in Isle View Park was chosen as a fitting tribute. A groundbreaking was held last week. The plan for the garden includes walls, which are a symbol of strength and perseverence. A trellis will align with the sun on the summer solstice to symbolize peace and hope, safety and passage. Benches in a quiet area will give people a place to sit and reflect; the garden will provide superb views of the Niagara River. Another small space surrounded by berms will serve as a place where people can meet. In addition to the Break the Cycle event, funding for the garden is coming from Erie County, many other organizations and private donations. In addition to monetary support, organizers are looking for volunteers to help maintain the garden, Curtis said. For next spring they are looking for people to volunteer time to do some planting. They are also looking for groups, such as garden clubs or scout troops, to take responsibility for one particular part of the maintenance, for example, to do spring clean-up. They’re hoping to have several groups so that one group doesn’t have to do everything. 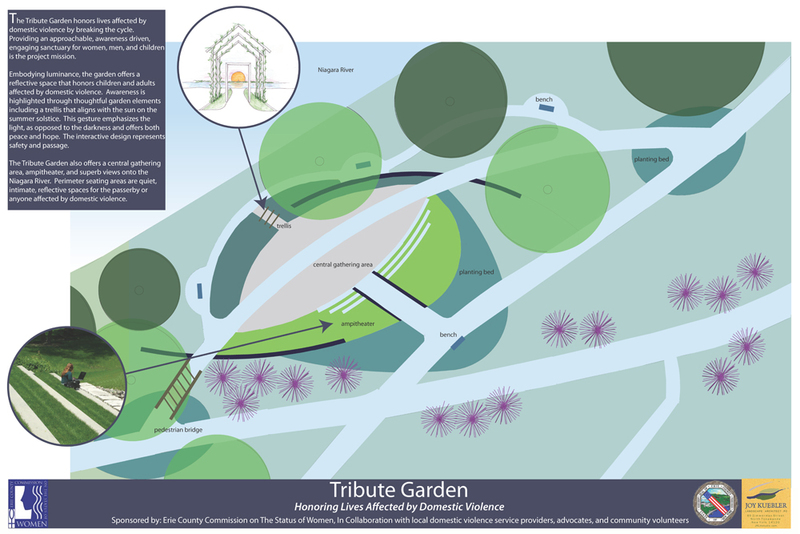 For more information on helping out the Tribute Garden, contact Sawrie Becker, executive director of the Erie County Commission on Public Advocacy, at Sawrie.Becker@erie.gov or call (716) 858-8307.